In primary care, asthma and rhinitis are common paediatric comorbidities for which long term inhaled or nasal corticosteroid may be prescribed. Atopic children may receive both, resulting in high cumulative doses of topical corticosteroids and increasing the risk of adverse effects. From 185 general practices in Scotland, we identified the number of children who were chronically prescribed both an inhaled and a nasal corticosteroid and calculated their total daily steroid burden between 1 November 1999 and 31 October 2000. We identified all repeat prescriptions for inhaled and nasal corticosteroid in three age bands (0-4, 5-11, and 12-16 years) and calculated the prescribed dose of steroid preparations for each child. General practitioners often prescribe a dose range—for example, two puffs, two to four times daily—for corticosteroids (49% of children were prescribed a dose range rather than a specific dose): we consider potential corticosteroid intake as a dose equivalent to beclomethasone dipropionate (by multiplying budesonide, mometasone, and triamcinolone doses by 1.5 and fluticasone propionate and flunisolide by two, and the potential maximum and minimum daily steroid dose expressed as the median and interquartile range for a beclomethasone equivalent dose. Of the 177 752 children registered with the 185 practices, 8913 children (5.1%) were chronically prescribed an inhaled corticosteroid. A total of 560 (6.3%) also had a repeat prescription for an nasal corticosteroid: 17 in the 0-4 year group, 240 in the 5-11 year group, and 303 in the 12-16 year group, equating to prevalence rates per 1000 children registered with a general practitioner of 0.36, 3.2, and 5.5 children aged 0-4, 5-11, and 12-16 years. The daily dose ranges equivalent to beclomethasone (figure) were 350-2400 μg, 265-3400 μg, and 300-4800 μg for the 0-4, 5-11, and 12-16 year olds. The relative contributions of the two types of steroid preparations to total daily steroid intake were similar for all age groups, with nasal corticosteroid accounting for at least a third of the total daily intake. Using these definitions, between 341 (61%, minimum steroid dose used) and 462 (83%, maximum steroid dose used) of the total 560 children identified as prescribed chronic inhaled and nasal corticosteroids may be subject to chronic high dose steroid use (figure). 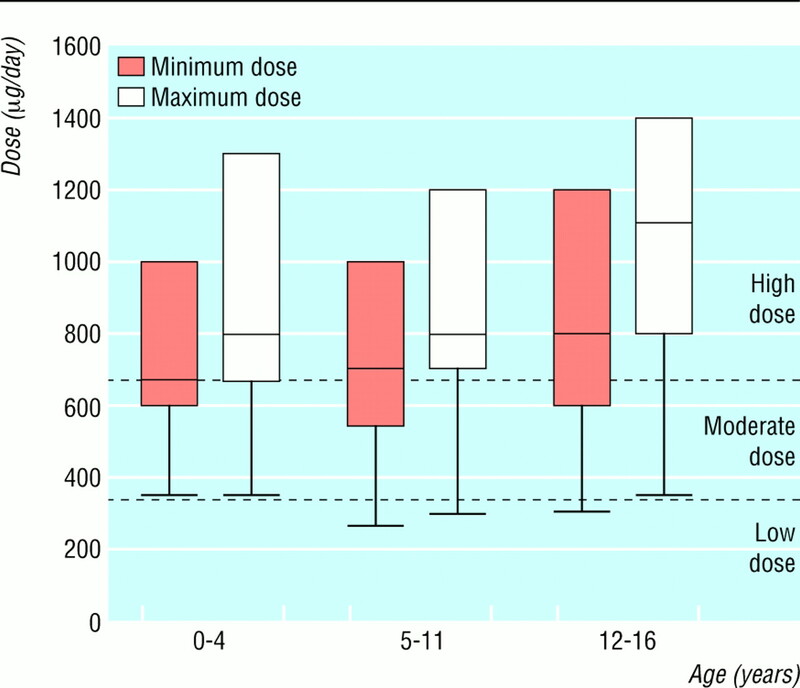 The potential long term toxicity of chronic corticosteroid use in children is unclear: most children with asthma eventually attain normal height, even receiving moderate corticosteroid doses, despite reports of adrenal suppression and reduced growth velocity.4–5 When more than one steroid preparation is prescribed, the total steroid burden should be calculated and consideration given to other treatment. Contributors: JM had the idea and framed the questions with SE-D. CS and SE-D analysed the data. SE-D and JM wrote the paper with contributions from PH and MT. MT is guarantor. Funding CS was supported by Merck Sharp & Dohme, UK. The continuous morbidity recording project is supported by the Information Services Directorate of the Scottish Executive Department of Health. .Completeness and accuracy of morbidity and repeat prescribing records held on general practice computers in Scotland.Br J Gen Pract 1996;46: 181–186. .Inhaled steroids in children: risks versus rewards.J Pediatr 1998;132: 381–383. .Symptomatic adrenal insufficiency during inhaled corticosteroid treatment.Arch Dis Child 2001;85: 330–334. .Effect of long-term treatment with inhaled budesonide on adult height in children with asthma.N Engl J Med 2000;343: 1064–1069.